This last photo includes a little mix of odds and ends from my brush collection, one from this or that company, that are worthy of mention here on Blogdorf's Brushed With Greatness. At the top is a Victoria Vogue white-bristle brush that might have been designed to be a shadow brush, but it's too large for that. I bought it at a drugstore, with one specific purpose in mind, to apply Laura Mercier Secret Brightening Powder to the undereye area over concealer. Its soft and moderately floppy bristles fit perfectly into that area, giving a very even, light application of the powder, keeping it right in the undereye area. It grips the powder very well, too. It is the perfect brush for this one important makeup task that I do every day. The Armani brush was sold to me at Saks, to go with the Luminous Silk Foundation. 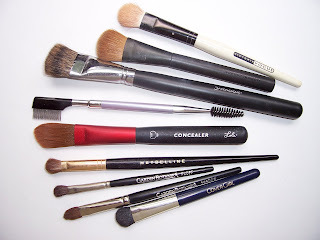 I've never used the brush with liquid foundation, Armani or not, because I just can't get a grip on the idea of natural bristles with liquid foundation. Granted, my MA at Saks used it to apply the foundation flawlessly to my face, but I can't seem to bring myself to do it. I use this brush for blush. The Japonesque flat wide brush sits in my collection, neglected. I'm not sure what the purpose of this shape of brush is. Please let me know what I should do with it! The lash comb/spoolie is a recent acquisiton from Tarte. It's a great lash comb, better than my expensive Rubis which lost some teeth one day when I was cleaning it. I love the long handle, it's easier to use than the folding Sonia Kashuk, and the spoolie is nice for brow grooming. The red-handle synthetic brush is the Lola Cosmetics concealer brush. Way way too big for undereye concealer application, but okay for spot-concealing on the face. I have actually used this brush for foundations. It works well with cream foundations. It may seem a bit small for face work, but it was certainly too big for the undereye area. The Maybelline shadow brush was cheap and nicely shaped for blending crease colors. Two short-handle shadow brushes from Garden Botanika are good for travel bags. One of them has a very useful v-shape, great for working a smokey color into the outer crease area. I've never seen another company offer a brush with this shape. The little stubby Cover Girl shadow brush was also a travel purchase. Who would think that such a nicely-made, well-balanced, usefully-shaped tiny brush could be found in a blister-pack on a peg at the Cover Girl wall! I need to repeat Discovery #1 here. I have too many brushes. i lost my favorite blush brush. :( do you have any recommendations? My favorite blush brush is the MAC white slanted goat hair brush in the MAC review. I'm reaching for this every day!